The story of Sergeant Stubby sounds like the exploits of a dog from a newspaper cartoon serial; from a stray dog who appeared at the New Haven Connecticut military training camp he became a genuine World War I hero who even caught German Spies! No one knows where Stubby originally came from. There is a lot of speculation over Stubby’s breed; but certainly his size and build made him look like a bull terrier of some sort. Whatever his history or breed, Stubby found his way to the military training camp in Connecticut. He would regularly come to watch the training drills, and became a familiar face that the soldiers enjoyed seeing around. One of the soliders, Private Robert Conroy struck up a friendship with Stubby, and even trained him funny little tricks, such as raising his paw as if to salute officers as they walked past. Being a very clever little dog, Stubby enjoyed watching (and no doubt joining in) the military drills and exercises. When it was time for the troops to ship out, to join the fight in Europe, Private Conroy could not bear to leave Stubby behind. Risking his career, Conroy smuggled Stubby aboard the ship. Mascots were not allowed to be on the front lines, and so smuggling a dog aboard against the rules and regulations was a serious offence. It was just a matter of time before Stubby was discovered, and so when Conroy’s Commanding Officer found that Stubby had been brought aboard Conroy feared the worst. However, Conroy should have known better. Stubby certainly didn’t let a little issue like a Commanding Officer be a problem. As a well-trained little soldier Stubby remembered his ‘military training’ back in Connecticut, and Stubby immediately saluted the Officer. According to Conroy, the Commanding Officer was so impressed that he allowed Stubby to stay on board. Stubby served for 18 months in France as part of the 102nd Infantry. Despite being under constant fire night and day, Stubby participated in 17 battles and four offensives. During one attack, Stubby was gassed, but survived. This experience taught him how to recognise the danger of gas attacks, and from then on he would alert his fellow soldiers, saving many lives in the process. His life-saving skills didn’t stop there – Stubby would locate and rescue soldiers from the dangerous environment of no-mans land. Stubby was also able to alert his fellow infantrymen when shells were incoming before any of the other solider could hear them coming. If all of those feats weren’t enough reason to commend Stubby as an indispensable member of the war effort, he was also responsible for apprehending a German Spy by biting and holding him by the seat of his trousers! The bravery and intelligence of Stubby seemed to have no limits, and the story of his exploits were well-known throughout allied territory. 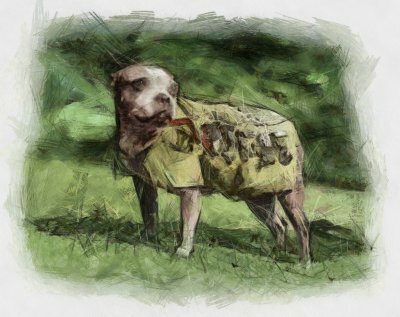 When US soldiers helped retake Château-Thierry, the townsfolk were so grateful, they made Stubby a coat made out of Chamois on which his many campaign medals could be hung. It was during a raid in 1918 that Stubby was injured, and sent to the rear of the lines to recover. Undaunted by his injuries, Stubby simply would not go off duty. 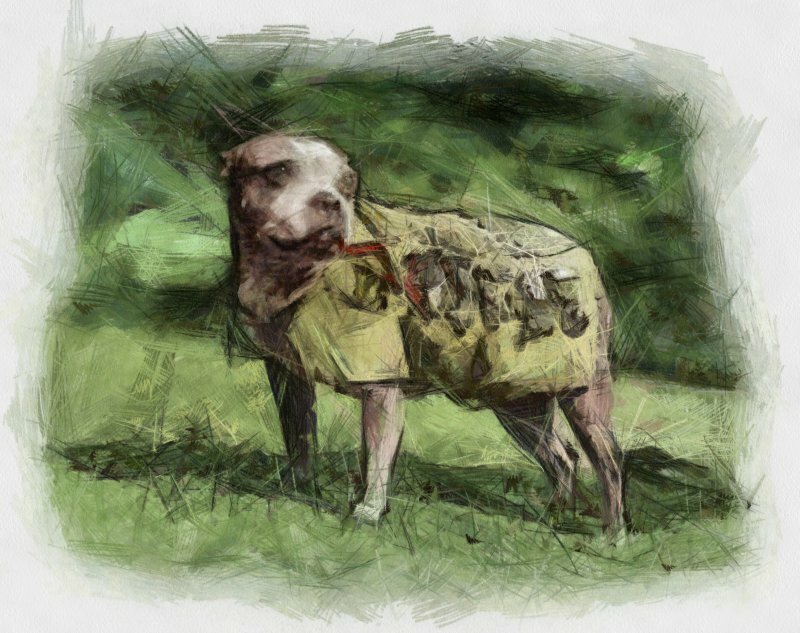 Stubby infectious personality and now-famous heroics were vital in improving the morale of injured personnel, just as he had done with the active soldiers while on the front lines. When Stubby had fully recovered from his injuries, seemingly undaunted, he returned to front line duty. Thanks to his exploits and medals, he was now known as “Sergeant” Stubby. It wasn’t just Stubby who had received a promotion; Conroy was now a Corporal. Despite Stubby’s heroic actions, Conroy still had to smuggle Stubby back to America when their tour of duty was over. Unbeknown to Sergeant Stubby, he had become something of a celebrity in his absence. The tales of his adventures had been recounted to an adoring public in newspaper reports during the war. Such was his popularity, he met a number of US Presidents; Woodrow Wilson, Calvin Coolidge, and Warren G. Harding. Sergeant Stubby even became the team mascot of Georgetown Hoyas’ baseball team after Conroy and Stubby attended Georgetown University Law Centre. At games, Stubby was given the football during halftime and would entertain the crowd with his antics. Sergeant Stubby passed away in the arms of Conroy in 1926. He is honoured with a brick in the United States World War I monument the “Wall of Honor”. His preserved remains are still featured in an exhibit at the Smithsonian. It is amazing to think that an unwanted stray animal (whose breed is often denigrated these days), saved countless lives, became a war hero, and it still celebrated to this day. Sergeant Stubby, we salute you!